This will be the last update for 2016. As you may be aware, we always wrap up the year with one of the most common English idioms about time, which is “time flies”. Time flies, of course, is used to say that time seems to be passing very quickly. Time flies when you’re having fun. Time flies when you’re flying first class. And time flies even faster as you age. 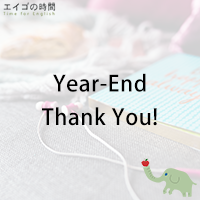 Anyhow, Kaori and I just can’t let the year pass without thanking you for your loyal support throughout the year. You always make us happy when you come visit our website or when you like us on facebook. Thank you so much. Kaori and I wish you a happy, healthy brand new year. We’re going to take a week off and be back on the 9th of January 2017. We hope you’ll join us again and continue to support us. See you there.